Unfortunately you can't edit the quantity of items in a multi-pack. Looking to order over 5kg? Enter your details below to arrange a discounted price. Message has been sent homeboy. Fill in the form properly dumbass. We have been making Sydney’s most popular biltong and related products for over 14 years. Reon and Lyndie Wilsenach established Springbok Delights, an upmarket specialty butcher shop in Lane Cove, in September 2000, almost 4 years after arriving in Australia. Along with selling great quality locally sourced produce, we started making biltong and commenced introducing this (traditional South African!) delicacy to the Australian market. Our second shop, African Delights, opened it’s doors to the public towards the end of Feb 2003 in Round Corner. We selected this location ostensibly to cater for the ever-growing number of South African expats relocating to Hills and surrounding area. It’s since become a popular destination shop for giftware, anything African and of course Biltong, Boerewors and Drywors! From the very beginning we supplied restaurants and retail shops with our Biltong and Boerewors. Our loyal and rapidly growing customer base, both in our retail shops and wholesale, meant increased demand for our products and we soon realised that we have run out of space! Due to this ever-growing demand for our products we opened our custom-built factory (The Biltong Man) in Mascot 6 years ago. 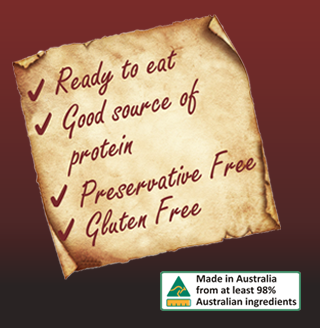 The Biltong Man is a fully HACCP accredited manufacturing facility with a current A-rating from the NSW Food Authority. Our factory is small enough to ensure the consistent high standard of quality in our products, yet our infrastructure lends itself to enable us to increase our current production levels threefold. We have recently invested substantially in new and improved processing- and packing equipment to streamline our production processes and increase capacity and product quality. We also manufacture Biltong for a select number of other butchers, using their own supplied meat to ensure their customers receive the same quality product they’re used to buying. Amongst these are Victor Churchill’s, Grass Roots Urban Butchers, Kingsley’s Meats and Sam’s Paddock and Vic’s Meats. Apart from making the best Biltong and Boerewors, we also manufacture hamburger patties, meatballs and a range of cooked and uncooked sausages for a select range of our customers. How do we make our Biltong? Our Biltong, Drywors and Snapstix are made the traditional way by simulating the cold, dry conditions of winter in the Highveld, this was historically the best time of year to make Biltong! The Biltong Man uses only MSA-graded, lean Australian Steer and Yearling topside steak in manufacturing biltong, thereby ensuring the quality of our end product. After we’ve cured the biltong steaks for 3 days in our own mixture of spices, vinegar and…(sorry, the rest is a secret! ), we hang our biltong on stainless steel racks off hooks and place them in our custom-built drying rooms. We circulate cold, dry air through our 10m x 8m drying rooms and slowly extract the moisture from the meat, very similar to the process of making prosciutto. Unlike some of those trying to emulate our products and methods, we do not use heat in our process as that dramatically changes the texture, colour and flavour of Biltong. Drying Biltong at a high temperature might speed up the process, but you then end up with an inferior product, similar to beef jerky where a lot of the nutrients have been lost! We pride ourselves on using our own unique recipes and mixing all of our own spices in-house. Our ingredients are sourced locally, negating the reliance on imported spices and shortages caused by delays in shipping etc. This also helps to ensure the quality and consistency of our Biltong and other products. 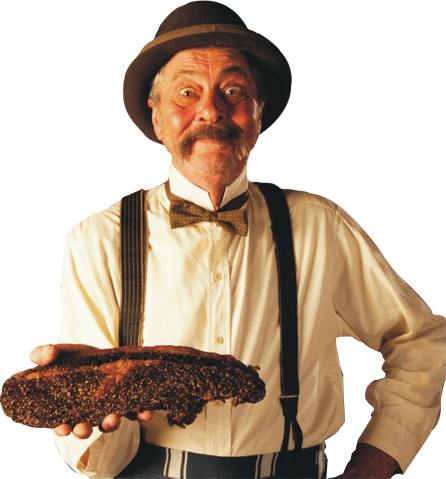 The Biltong Man pioneered the manufacturing of Wagyu Beef Biltong approximately 3 years ago. Wagyu Beef has a beautiful, marbled texture and is higher in omega 3 and Omega 6 fatty acids. This delicacy might be a bit more expensive than our normal lean biltong, but the exceptional flavour and rich, creamy texture is incomparable to anything you’ve tasted before. Once you’ve experienced this symphony of flavour, you will never forget it. We believe that “Umami” is the best word to describe this unique taste! Who do we sell to? We market our products, amongst others, at Trade Shows, Good Food & Wine Shows, and recently at the Royal Sydney Easter Show. We have experienced a very strong growth across our whole range of products, both packaged and fresh. As this is predominantly amongst the main-stream Australian market, this is extremely exciting as Biltong and Drywors was traditionally only known to South Africans. Our stands are normally one of the busiest at the shows!  We supply a vast number of IGA stores (formerly Franklins), independent grocers, butchers, bottle shops, hotels, pubs, sports clubs, service stations, and numerous other businesses. The ALDI Group has ranged our Biltong and Drywors for a “Special Buys – a taste of South Africa” promotion. This made our product available in-store across Australia from 17 April 2013 for the duration of the promotion. Very exciting indeed! Our philosophy is simple: We are constantly and consistently striving to exceed your expectations! Our integrity and the quality of our service can be experienced in the quality of our products. We believe that our Biltong and related products are superior in flavour, texture and quality to any other similar product currently available on the market, and back that by our full replacement guarantee. In other words, our goods are simply the best! On a personal note, I wish to express my heartfelt gratitude for all the interest and support I have received over the years. It’s been both humbling and rewarding and I am forever grateful to everybody who has contributed to our success. We look forward to sending you some Biltong soon!